I was coaching a member of the Direct Sales Virtual Academy last month around finding harmony between her work and her personal life. She was having a hard time setting boundaries for her growing team and I didn’t seem to be getting through to her about how important this was, not only for her but also, in the long run, for them. Finally I asked her, “Do you give your kids everything they want whenever they want it?” “Of course not” she answered. “Why not?” I asked her. She said she was a tough mom and pretty much expected her kids to act appropriately and learn to take care of their own needs. I asked her why and she said it was because they had to learn to become independent and self sufficient. 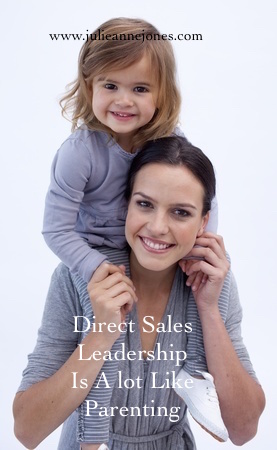 Her answer was a big aha moment for her regarding her direct sales team. Here’s the point. I’d venture a guess that you would never dream of letting your kids get away with what you let your direct sales team get away with…calling you at all hours and demanding your attention, crossing boundaries you’ve set up regarding how and when you’re available, giving them the answers they’re capable of finding on their own because it’s just easier (you don’t do your kids homework for them, right? You may know perfectly well how to spell a word, but you make them look it up anyway). To be an effective direct sales leader and develop a team of independent, responsible, and ultimately successful direct sales professionals, you have to “parent up.” (Like manning up, but more appropriate for our purposes). People rise to the level of expectation you set up for them. And if you keep answering every single question your new team members have (not to mention answering your phone every time they call, no matter what you’re doing or what time of the day or night), you’re robbing them of the ability to learn their own answers and become self sufficient. In essence, this is just like bad parenting. And, just like parenting, it’s not easy. You have to resist the temptation to do it for them and allow them the space and experience to sometimes figure it out on their own. Make sure they know how to use your company resources like distributor websites, training materials, webinars, or teleseminars, their training manual, and phone or online support from your home office, and then give them a chance to learn to use those instead of responding instantly every time they call or e-mail you. I set up a weekly appointment with my new representatives. They had at least 15 minutes a week of my undivided attention during this standing appointment. That was their time, guaranteed. I made it clear that, for the most part and with the exception of emergencies, I was not available to them outside of that time. Not only did it force them to be resourceful, but it also demonstrated a balanced lifestyle from their leader (me). That way, they could see themselves doing what I did (leading a team) at some point without feeling overwhelmed or sacrificing their personal life. Does this make sense to you? Do you agree?